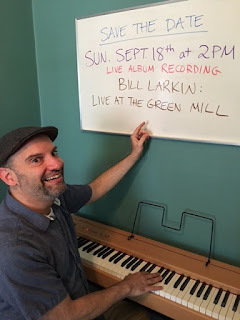 If you've enjoyed the musical comedy of Bill Larkin during his frequent appearances as one of Paper Machete's house artists, you won't want to miss this! On Sunday, he will be recording a live album at the Green Mill and the public is invited to be part of it. Hear him play the city's most famous piano at the historic Green Mill Jazz Club. Bill is a pianist who writes and performs songs in a manner not unlike Tom Lehrer's '50s and '60s cabaret albums, but of course quite contemporary and frankly often blue and bawdy as all get-out. He's a brilliantly theatrical and ferocious entertainer (and a Jeff-award winning actor) who has the rare skill set of comedic songwriting chops on par with the best political satirists on the scene. There's really no one else in Chicago who does what he does, and this concert recording will feature a bill of his most hilarious songs. A HIGHLY recommended way to kill a Sunday afternoon in Uptown. It's a $5 cover and the show starts at 2pm on Sunday, September 18. Here's the Facebook event.